Greenwich Village, or simply referred as “the Village”, located on the west side of Lower Manhattan. 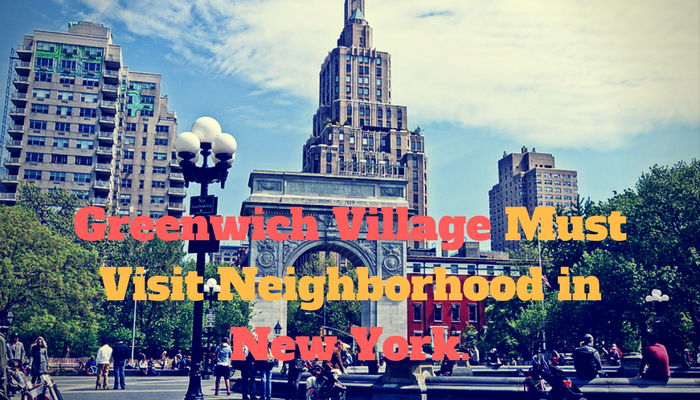 Greenwich Village is filled with so many fun things to do you can keep going again and again and never tire of what this part of New York has to offer. There are so many different venues to choose from including bars, clubs, restaurants, and stores so you won’t have a problem finding something to do. My favorite thing to do in Greenwich Village is shop. I am huge on vintage clothing shopping and this is the best place to do so. People who love consignment shops will be in heaven here as well because they are all over the place. Aside from vintage clothing shops there are all name brand shops as well around the village. This is a great area to hit if you are in need of a day of shopping. Another great thing to do in Greenwich Village is visit Washington Square Park. If you have never been here before it is certainly something to check out. It is a good idea to go in the warmer seasons like spring, summer, and even early fall because you can really enjoy being outside and taking in the sites. I have been to the nightclub 2-4-1 Wednesdays and it was a really fun time. I went with a few girl friends and we just had a blast. They have themed nights like 80’s or 90’s night so if you are looking for a good place for a girls night out this is a place to check out. If you like Jazz, I would recommend to go is The Blue Note Jazz Club, which is located on 3rd Street between MacDougal Street & 6th Ave. You can have dinner here and listen to a live Jazz performance. I have been here a couple of times and each time the musicians were truly very talented. The Blue Note was also recommended on The Brilliant Street Travel Blog. Also according to The Brilliant Street Travel Blog, The Telephone Bar is another place to stop at if you are looking for a place to have drinks. This bar is located on 2nd Avenue between 9th and 10th street.